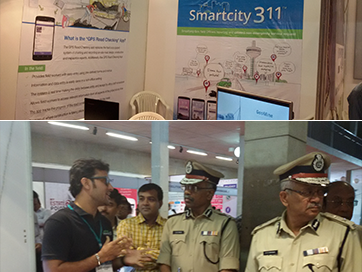 We are pleased to share that we had our booth at the Smart City Techno Fair that occurred for three days (29th to 31st October 2015) in the city of Surat. The Surat Municipal Corporation (SMC) had organized ‘Smart City Techno Fair’ in which information technology, as well as electronic companies, had demonstrated tried and tested out-of-the-box ideas and technologies. More than 150 such companies from 10 different sectors had participated in the event. At the fair, our company presented our developed SmartCity-311 solution among visitors. The fair visited by the Surat Police Commissioner and Surat Crime Branch Commissioner and it was honored for us to present our application to them and give information about it!